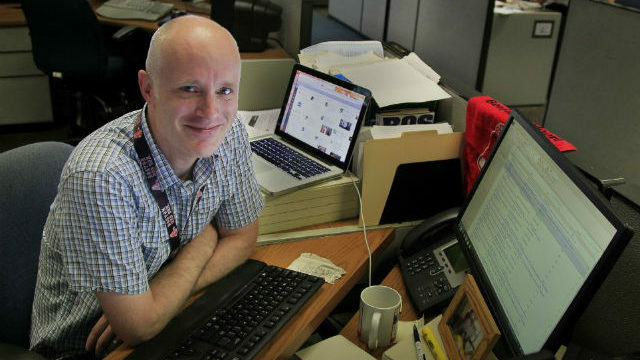 Matt Hall at his desk in the Union-Tribune. The San Diego Press Club will celebrate its 45th annual Excellence in Journalism awards program on Tuesday evening. More than 525 awards in over 180 categories will be presented to print and broadcast journalists and photographers. More than 450 people are expected to attend the event at the Jacobs Center for Neighborhood Innovation’s Joe and Vi Jacobs Community Center. About 20 restaurants and 10 wineries, plus several craft beer breweries, will provide refreshments. Retired broadcaster Dennis Morgigno will serve as emcee. At the event, the Press Club will present three special awards, including the Harold Keen Award for outstanding contributions in journalism to Lori Weisberg, a writer for the San Diego Union-Tribune; the Jim Reiman Award for excellence in media management to Matthew Hall, editorial and opinion director of the Union-Tribune; and the Andy Mace Award for career achievements in public relations to Jack Berkman, president and CEO of Berkman Strategic Communications. 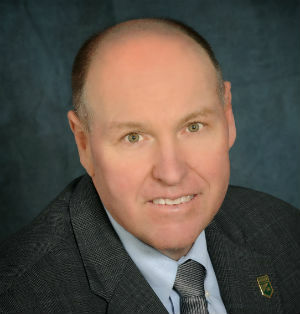 Weisberg, a Southern California native, currently covers tourism and hospitality. 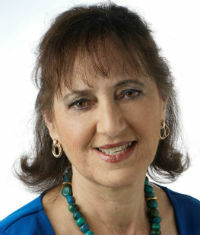 She wrote for the Vista Press and Orange County Register before joining the U-T in 1980. Weisberg’s award is named after Harold Keen, who anchored San Diego’s first television news broadcast in 1949 and was described by colleagues as the dean of San Diego journalists. Keen arrived in San Diego in 1936 as a reporter for The San Diego Sun. He later worked for the San Diego Union, San Diego Magazine and KFMB-TV/Channel 8. He passed away in 1981. 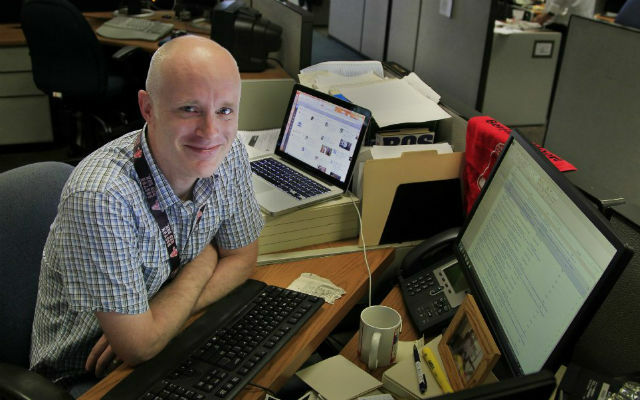 Hall manages the newspaper’s Ideas and Opinion section, writing and editing editorials, and overseeing op-ed commentary, letters to the editor and a blog called “The Conversation,” which uses social media and the Internet to report the news of the day. Hall’s award is named after Jim Reiman, who served for many years as assistant news director at KGTV-TV/Channel 10. Reiman was considered an unsung hero of the profession, similar to many behind-the-scenes journalists who do not have a byline nor appear on camera. When Reinman retired, the Press Club created the award to honor enlightened media managers and the first recipient was KGTV assignment editor Jack Moorhead in 1997. Berkman, with 40 years of experience in PR, is a member of the Public Relations Society of America’s College of Fellows and has won more than 70 Bernays awards from the San Diego PRSA chapter, plus the national PRSA Silver Anvil Award. Berkman’s award is named after Andy Mace, former public relations manager at Pacific Telephone in San Diego. In 1971, Mace is credited with the idea of starting the San Diego Press Club. He later started his own company, Andy Mace & Associates, with an office at the Mission Valley’s Stardust Hotel & Country Club, now the Handlery Hotel. He passed away in 2009 at age 88. In addition, two college students will each receive cash scholarships at the Press Club event. They include: Lauren Mapp, San Diego State University, $2,500 Joe Lipper Scholarship; Katy Stegall, Southwestern College, $1,000 scholarship from the San Diego Press Club Foundation. Both have been active at their student newspapers. Mapp has served as editor of The Mesa Press at Mesa College and as a staff writer and photographer at The Daily Aztec at SDSU. Stegall has reported for The SWC Sun. This year’s awards program drew a record 1,200 entries, making it one of the largest journalism competitions in the nation. Judges included members of press clubs in San Francisco, Los Angeles, New Orleans, Rochester, Florida, Cleveland, Orange County, Milwaukee, Tulsa and Alaska. The Crowe PR team at the PRSA awards ceremony. 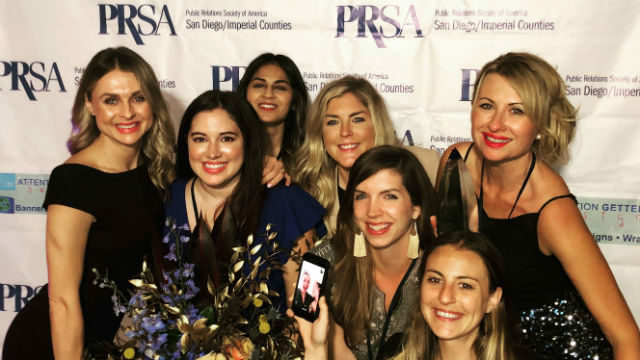 San Diego public relations firms Mixte Communications received 15 awards and Allison + Partners took home 12 awards at the recent 2018 Edward L. Bernays Mark of Excellence award program presented by the Public Relations Society of America’s San Diego-Imperial Counties chapter. A total of 78 awards were presented Oct. 25. Three entries were awarded Best of Show, recognizing the highest scores among the silver and bronze award recipients. Silver Best of Show awards were given to Mixte Communications in the public affairs category and Allison + Partners in the consumer products and services category. A Bronze Best of Show award was given to Mixte Communications in the newsletter category. Five special awards were presented, including: Jeanna Vasquez, Sharp HealthCare, New Pro of the Year; Joice Truban Curry, c3 Communications, Eva Irving Community Service Award; Elizabeth A. Pecsi, San Diego Humane Society, Otto Bos Lifetime Achievement Award; Elizabeth Hansen, Southwest Strategies, Deborah Baker PR Professional of the Year; Crowe PR, PR Team of the Year. A complete list of winners is available at www.prsasdic.org. It was the 26th year for the local chapter’s Bernays Awards. KUSI-TV, XLTN 104.5-FM Radio Latina, El Latino and San Diego Family Magazine have stepped forward to support Kids Care Fest, a health fair for children to be held from 9 a.m. to 1 p.m. on Saturday, Nov. 3, at the Lemon Grove Recreation Center, 3131 School Lane. KUSI-TV’s “Good Morning San Diego” show is planning a live remote. Radio Latina will be on site with host Jesse Vazquez. Now in its 17th year, Kids Care Fest is an opportunity for children and their families to receive free, vital health care screenings, including vision, dental, and wellness checkups. The event also will feature information about health insurance and social services from organizations all over San Diego County, along with free kids fingerprinting and free flu shots for all guests age 4 and over. A San Diego Food Bank partner, Heaven’s Windows, will donate free groceries this year for guests to take home while supplies last. Additional free activities will include rock climbing, an inflatable obstacle course and pony rides, along with demonstrations and displays by law enforcement, including police and fire officials. Also available will be free children’s reading and coloring books (while supplies last). For more information visit www.KidsCareFest.org or call (619) 825-5050.